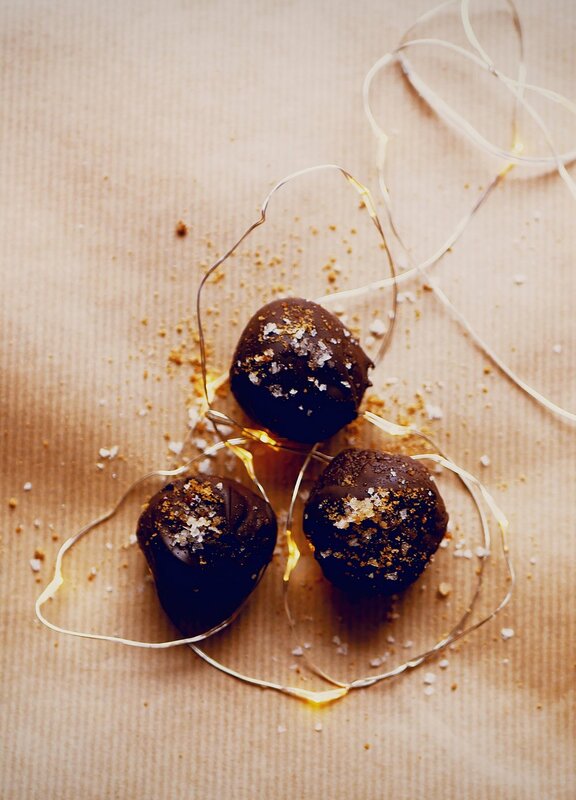 These double chocolate truffles are very similar to my gingerbread chocolate truffles I made last week, sans le ginger of course. Fraser isn't too keen on ginger buts he's rather partial to a double chocolate truffle instead! They're super easy to make and would be a lovely little edible chocolate gift. 1. Pop the oats, walnuts, cacao powder, olive oil, sultanas and honey into a food processor and mix thoroughly. I usually pop the dry ingredients in first and add the wet ingredients last. Mix until a giant ball of goodness has formed. 2. Roll into balls and dip into melted dark chocolate. 3. Refrigerate for 30 mins and then sprinkle the top with sea salt crystals and the sugar. 4. I like pressing the bottom of each truffle into the sugar to add an extra touch of sweetness.